Personal Discount Support: How does Personal Discount work? How does Personal Discount work? Personal Discount generates unique discount codes on specific events. It may be a new subscriber joining your audience in Mailchimp, a customer making a purchase, or a person abandoning their cart. The app saves the generated codes in your Shopify store back-end so they can be used at checkout. Discount codes are also being assigned to the members profiles in MailChimp. You can find them in subscriber profile information as Shopify Discount Code and include a discount code in your email template using a merge tag *|DSCNT_CODE|*. 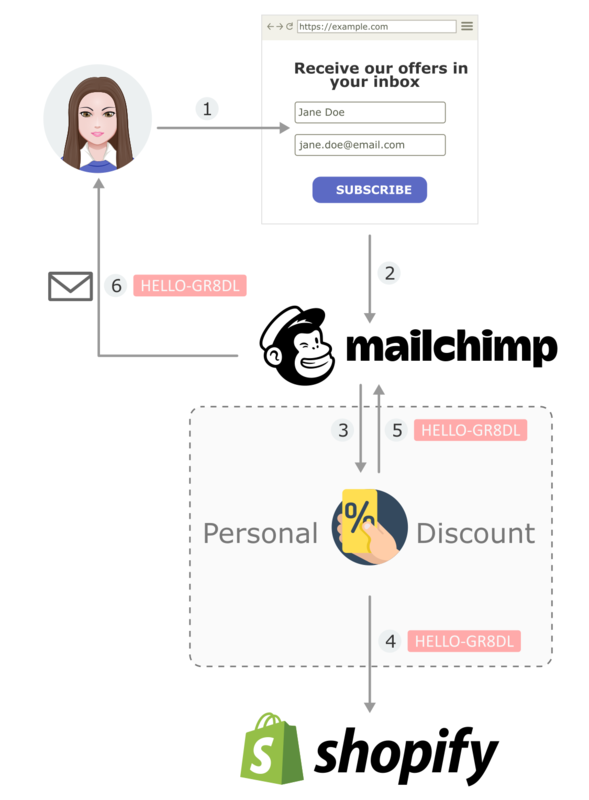 The key fact to understand how Personal Discount works is that it's the app pushing the codes to Mailchimp rather than Mailchimp pulling them from Personal Discount. That's why it's crucial to choose a right trigger, to point out the moment when a discount code should be created and pushed to Mailchimp. Jane fills out your email subscription form. Jane's data are being saved in MailChimp. MailChimp notifies Personal Discount about a new subscriber. Personal Discount generates a unique discount code HELLO-GR8DL and adds it to your Shopify store discounts. Personal Discount assigns the generated code to Jane's profile in MailChimp under a merge tag *|DSCNT_CODE|*. MailChimp sends a welcome email to Jane including the unique discount code HELLO-GR8DL. To make this happen you need to set up an Automated Campaign in MailChimp.